snapshot of their point of view. Through her coursework, Nancy Wolfson not only teaches people the art of breaking down scripts and performance techniques that are necessary to book work, but she helps the individual come to understand the unique selling proposition that their vocal style presents in the marketplace. Nancy Wolfson possesses the rare quality of being able to break down her area of mastery and then reassemble it in a coherent and logical structure that makes learning a “Wow!” journey of discovery. Her approach to voiceover coaching is easy, fun and insightful. She just gets the business side of voiceover and trims the fat – it’s like gaining a degree in a tenth of the time. I’ve progressed very quickly with Nancy’s guidance and personally I’ve found learning voiceover with her to be a life changing experience. My business career spans 25 years and 22 countries and I’ve been fortunate enough to work with some of the true geniuses around the world in marketing, media, copywriting, Internet business and philanthropy. 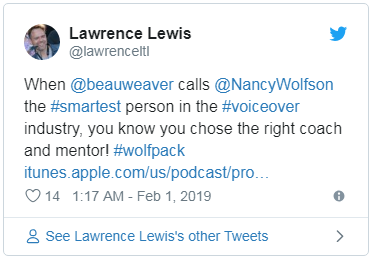 I add Nancy to that very short list of consummate professionals who have mentored me and to whom I fondly credit the basis of my success in life. Great story here to share with you. I got a call this morning from Aquavision in Johannesburg. They are one of the top wildlife documentary houses in South Africa. They are booking me for a documentary that may run on Animal Planet, I don’t have all those details yet. But the interesting part of the story is I have never had contact with them, no marketing in their direction, it wasn’t an audition. They used search engines for narrators and my site caught their attention. The producer loves my voice and said I was perfect for the project. I clearly had to have the talent to get the job, but the site is what they first saw, so, I thought you’d like to hear that. I am most happy with our collaboration!